SWC follows a story that supposedly takes from the 1500s era of Japan and follows the lords and all the wars of that time. The game is in Japanese with English subs; however, they do a decent job of translating, even though I can't say I actually learned much about Japanese history from this game. Just one of the many crazy combo finishers. The game is played from a third-person view of your avatar running around a pretty big map, hacking away at enemies while completing various missions. Every mission involves killing someone in some way; that's pretty harsh, I know. Missions are automatically given to you while you play and can sometimes overlap, so if you're slow, then you'll end up failing these missions, making the rest of the battle much harder. This is where strategy comes into play for sending each of your four officers to certain areas to ensure completion of the missions. Even if you fail the level, you still collect all the goodies you've accumulated. One of the coolest things about the game is the characters you play as. Yes, you get your very own character with his giant sword and rifle (male lead), but the other officers you meet and control can offer a refreshing experience to the game. The game is far more enjoyable playing each of the over 40 different officers with their own unique weapons and abilities. 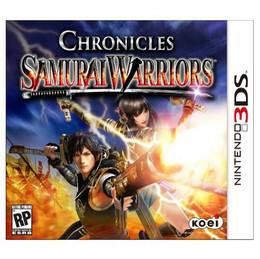 Some characters have giant scythes, axes, hammers, bows, guns, and even a giant spear that shoots fire and cannonballs! We can customize each character's weapons with attributes by combining them, allowing us to customize our officers slightly. This guy uses a giant... Actually, I don't know, but it has spikes and gets bigger when he hits. Relationship events occur throughout the game, where we pick options during the dialogue to learn more about officers to increase friendship levels. If we get the maximum level of friendship with officers, then we can actually use their weapons and battle mechanics in place of our own main character's, which is pretty sweet for levels where we can't use them or simply prefer their combat styles. Pros - There's decent explanations of the battles and events taking place, which explains the motives of each officer. Friendship events allow for great overall character developments, with over 40 officers to do this for. Cons - The story is definitely not the strongest attraction and doesn't really make us want to keep playing to find out what happens. Choices are usually obvious to pick and don't really change anything or have lasting effects. 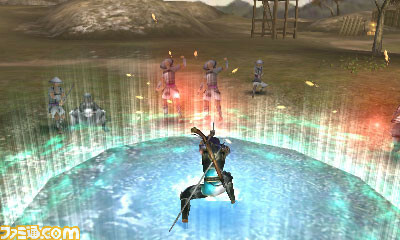 Pros - Battles allow for multiple difficulty settings and also for a clean flow to the levels, with constant missions. Over 40 playable characters with different mechanics is the STRONGEST part of this game. Free DLC updated automatically. Cons - Battles get tougher and can snowball if we start failing, forcing us to be perfect, or lower the difficulty. All we're doing is killing enemies. Pros - In-game graphics are low quality, and the 3D part is what makes this game awesome to look at (sorta). Cutscenes are stunning with or without 3D. Character models during conversations are great. Cons - In-game graphics without 3D is disappointing, so keep that 3D slider on at all times. Enemies are ugly, with exceptions to the officers. Overall, this game gets a 6.5/10 from me. Playing as over 40 characters is what makes this game great as a hack n' slash. Customized weapons and equipping items is a great way to spend time on your officers and for taking a break from killing those 500 enemies in one battle. I'm actually surprised there's still an army to fight after killing so many people. The character events require a lot of playthrough and time to get them all, but that (and the added free DLC) is a great way to keep you interested in playing the game.